Are the Phillies the team to beat? It is a new day and age for baseball in the National League. The National League East has been a hot topic for baseball over the last week since Bryce Harper signed his record 13 year deal worth $330M. Harper’s signing has created a regenerated sense of fandom in Philadelphia and has caused an blurred outlook on expectations for this season. The years since 2011 have been difficult in Philadelphia. The team saw a roster that once dominated the division drop to the bottom of the same division within mere years. A complete rebuild of the team took place. Veterans that led the way for the 2000’s and Phillies were traded away one by one to complete their careers for other franchises. There’s no more Chase Utley, Jimmy Rollins, Cole Hamels or Ryan Howard to keep the fans interest. A big splash needed to be done to bring the franchise fully back and fully engaged. That splash of course is Bryce Harper. He is being viewed as the Prince that was promised. A savior for a beaten down fan base that has longed for the success of a decade ago. Harper’s signing is without a doubt huge for the Philadelphia Phillies franchise and the city of Philadelphia, but it is very interesting to see that the consensus is that the Phillies will run away with this division. That is easier said than done. Every team in the National League East besides the Marlins have made moves to get better this off-season. Even Las Vegas odds makers have the division being one of the closest contested in all of baseball, but yet it almost feels like the Phillies are now expected to run away with the division. Is this a lack of respect for the other teams or is this being caused by a pure admiration for what Bryce Harper is expected to do in Citizens Bank Park for the next 13 years? The Nationals may have lost Harper to the Phillies but they still have one of the best pitching rotations in all of baseball. Max Scherzer, Stephen Strasburg and newly acquired Patrick Corbin will without a doubt make it difficult to win any series against the Nats. Washington also still as some of the best young talent in baseball, especially outfielder Juan Soto. Who is to say that Soto won’t exceed expectations again this season and make Washington fans forget about Bryce Harper? The Mets also sport one of the best pitching rotations in the Majors led by Noah Syndergaard and Cy Young Winner, Jacob deGrom. The problem is that there has been a clear inability for the two pitchers to stay healthy for a full major league season. The Mets have also brought in veteran position players such as Robinson Cano, Wilson Ramos, and Jed Lowrie to help wake up their struggling offense from a year ago. In addition to the added offensive firepower they have also brought on board the league’s best closer last year, Edwin Diaz. The Braves seem to be the forgotten team in the division and they are the defending NL East champions. They have added third baseman Josh Donaldson to a core of players that exceeded expectations last year and includes some of the best young talent in the game. 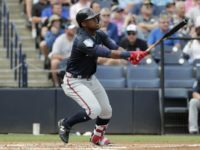 Freddie Freeman is still an MVP level first baseman for the Braves and Ozzie Albies impressed during his first year with the big league club, but it is very clear that the Braves offense got kicked into high gear when Ronald Acuna splashed onto the scene in 2018. Overall, every team in the NL East brings something to the table that another team may lack. There is no clear favorite, no matter what television reporters are saying. This division will be as competitive as ever. The days of one team running away with first place seem very far behind. This is going to be fun to watch. Opening day can’t get here fast enough!